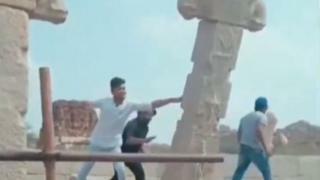 Four men, who were earlier arrested for vandalising a Unesco World Heritage site in the southern Indian town of Hampi, have been made to fix the pillar that they pulled down. In a video clip that went viral earlier this month, three of them are seen shoving a pillar, causing it to break. A court ordered the men to fix the structure after fining them 70,000 rupees ($980; £760) each. Hampi is famous for its 16th Century ruins and is a popular tourist spot. "They took about four or five hours with the assistance of our workers to re-erect it," Muthaiah Kalimuthu, an official from the Archaeological Survey of India (ASI), told BBC Hindi's Imran Qureshi. After it surfaced on social media, the video prompted widespread outrage. On 8 February, police arrested four men, including the three who pushed the pillar located outside a temple and a fourth man who was filming the incident. Mr Kalimuthu said the ASI was reinforcing the pillars at the temple so that they would not be easy to vandalise. "It will take us around a week to finish this project," he added.